Humanity’s history is closely linked to those of camels. Without these remarkable animals we could not have inhabited the arid zones of Asia and North Africa, nor could we cope with today’s challenges of increasing desertification. Researching interactions between humans and camels therefore has been established at the Austrian Academy of Sciences ever since its foundation more than 160 years ago. The present publication is committed to this research tradition. 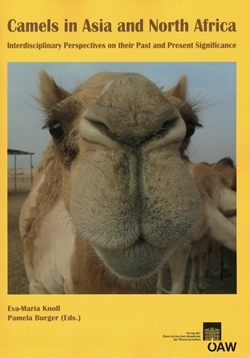 This book assembles insights upon current and historical interactions between humans and camels. Thereby it is international and interdisciplinary from the outset and aims at intensifying a camel-related knowledge exchange between the natural sciences and the humanities. The here presented discussions of Old World camels (dromedary, Bactrian, wild camel) include such diverse topics as camel origin, domestication, breeding, raising and commerce. Moreover, camels’ significance is also discussed regarding socio-cultural and economic factors, music, folk medicine and veterinary medicine, as well as saving the last remaining wild camels. With an afterword by Richard W. Bulliet (New York), one of the world’s leading authorities on the camels’ history. باحثة في معهد علم الانسان - الاكاديمية النمساوية للعلوم باميلا بيرجر باحثة وحاصلة على منحة جزئية من جامعة الطب البيطري، فينا الجِمال في أسيا وشمال أفريقيا	منظور التخصصات لأهميتها في الماضي والحاضر التاريخ الانساني مرتبط بشكل وثيق مع الجمال. فمن غير هذه الحيوانات المتميزة، لما كان بالإمكان استيطان المناطق النائية في أسيا وشمال أفريقيا، ولما كان بالإمكان التأقلم مع تحديات اليوم فيما يتعلق بالتصحر. وبالتالي فإن البحث في التفاعل بين الانسان والجمال تم إنشاءه في الأكاديمية النمساوية للعلوم منذ ما يقارب اكثر من مائة وستين عام. حيث أن هذا الكتاب مرتبط بهذا البحث التقليدي. كما أنه يلقي الضوء على التفاعل الحالي والتاريخي بين الانسان والجمال. لذلك ومنذ البداية تم اعتباره عالميا ومتخصصا ويهدف للتركيز على يتعلق بالمعرفة المتبادلة عن الجمال بين العلوم الطبيعية والإنسانية. With contributions from: AM Abdussamad (Göttingen/Nigeria), AA Bakhsh (Al-Ahsa), N Benecke (Berlin), RW Bulliet (New York), J Burger (Mainz), P Burger (Vienna), Cheng Yun (Xinjiang), O Chuluunbaatar (Vienna), WM El-Deeb (Al-Ahsa), M Dioli (London), W Dostal † (Vienna), E Dulamtseren (Ulaanbaatar), IEM El Zubeir (Khartoum), B Faye (Montpellier), A Fischer (Vienna), A Gingrich (Vienna), J Hare (Benenden), J Heiss (Vienna), A Iqbal (Faisalabad), A Al-Judaibi (Jeddah), P Kaczensky (Vienna), DJU Kalla (Aberdeen), J Kinne (Dubai), EM Knoll (Vienna), C Knospe (Munich), G Konuspayeva (Montpellier), MK Lang (Vienna), SA Maigandi (Sokoto), DM Mwangi (Nairobi), J Peters (Munich), RP Reading (Denver), SR Shunnaq (Irbid), M Shunnaq (Irbid), K Silbermayr (Vienna), D Tabbaa (Hama), A Trinks (Mainz), HP Uerpmann (Tübingen), M Uerpmann (Tübingen), DM Varisco (New York), C Walzer (Vienna), NA Wani (Dubai), U Wernery (Dubai), A Yadamsuren (Ulaanbaatar), M Younan (Nairobi), Yoan Guoying (Xinjiang), Yuan Lei (Xinjiang).